The pull up is one of the most effective and important exercises to train. It balances out a lot of the pressing work you perform, improves postural strength muscles, and builds a sculpted back. Alongside these key benefits, it’s also the centerpiece of any type of gymnastic strength. But, like many other gymnastic exercises, it comes with serious challenges to strength and technique. Today we’re discussing pull up assist bands: what a band can do for your pull ups, how you can use them, and the best pull up assist bands on the market. Read on if you’re ready to get your pull-ups and all the benefits that come with them! Do Bands Help with Pull Ups? Which Band (Which Color) Is Right for Me? 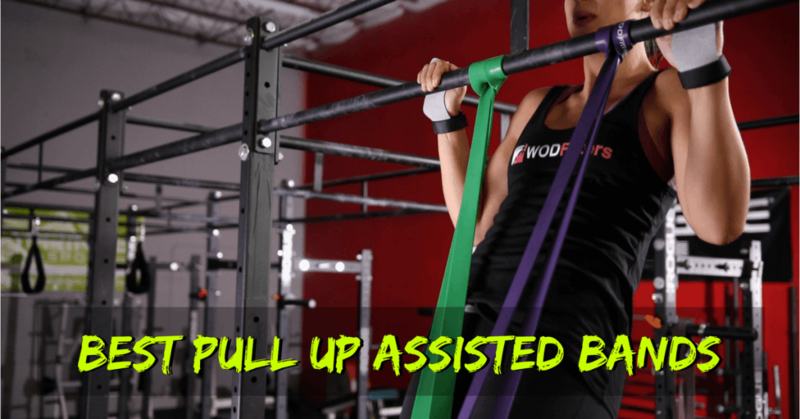 What Makes the Best Pull Up Assistance Bands? ❯ Should you buy a single band or a band set? ❯ Can you use two resistance bands at the same time? 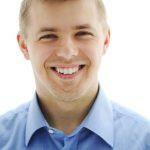 ❯ Should you secure the band under your feet or under your knee? ❯ Beside pull-ups, what exercises you can use these bands for? ❯ How long should my assisted pull up bands last? ❯ How do I maintain & clean my bands? Despite the name, these bands are all about effective elastic resistance and come in a great range. Bands range from 15lbs to 150lbs of tension, providing a full spectrum depending just how much assistance you need. On top of that, they provide both four- and six-band sets to allow you to get all your band at once for a hefty discount. This is a great start and the bands seem to be well made – existing customers are rarely concerned with build quality or durability. Given the intended use of these bands, this is a great reputation to build! There are concerns for the intense latex smell that the band comes with during the first few days, weeks, or even months of use. There are also very rare reports of peeling or degradation of bands during early use. These concerns are legitimate, but they affect an incredibly small number of customers so far and seem to have been mostly-resolved over the past few years. 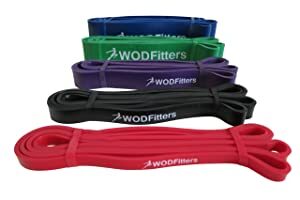 WODFitters’ resistance bands for pull ups have a narrower range than Serious Steel. They provide resistance between 35lbs and 175lbs, but across 5 bands rather than 6. This means that you’re going to have a tougher time changing from one band to the next since jumps between the bands are much greater. Additionally, the smallest band at 35lbs of tension is more than many individuals will need. It’s also probably too much to use as a combined band and reduces your ability to micro-load your pull ups, directly making this product less effective. Problems for WODFitters are usually related to quality assurance, with products occasionally turning up pre-damaged. They also tend to fray and/or break far more often than Serious Steel or some other brands of resistance bands. Obviously, this is a huge concern for customer service and the integrity of a product you’re trusting your whole bodyweight to. We’re suspicious of the actual tension-ratings of these products looking at the thickness and damage sustained by the smaller red bands, so you might give this product a miss! With a huge financial and cultural base in CrossFit and functional fitness, it’s no surprise that Rogue comes in with the largest range of products we’ve seen so far. They offer 8 thicknesses of bands, from 15lbs of resistance to 200lbs, with the most regular band-difference so far. This offers you the best amount of support to your goals, offering a variety of ways to combine bands and change the amount of resistance you’re receiving. This is key to helping your pull ups. We also love the pricing structure Rogue uses, where a pair of bands brings down the overall price-per-band significantly. This is primarily useful for weight training, but it’s a good sign! The durability and quality of the Rogue bands is also well-regarded on the market with similar levels of customer satisfaction to Serious Steel. We’ve worked with these bands sporadically over the years and can confirm that they’re effective and hard-wearing. We can say these are definitely competitors with any other product on this list, while the logistics, buying options, and range all put Rogue squarely in the #1 spot of the products we’ve seen so far. WOD Nation isn’t as consumer-friendly as other products on this list so far. That’s something that comes from two simple facts where they fall short of all the others: there are no band-sets and the range is only 5 bands across 35 – 175lbs. This brings an exaggerated version of the problems we saw with the WODFitters products: you’re not going to be able to progress sustainably or quickly through the bands since each jump is huge. The lack of band sets also means you’re going to be paying a significant amount more for the whole set than you would with Serious Steel, for example. The customer satisfaction seen with this product is the exact opposite, however. The durability and quality of the products are well-regarded and comparable with both Rogue and Serious Steel. This is clearly a great product but the actual range and logistics of buying put it squarely into 3rd place of the products we’ve discussed. MummyStrength isn’t just for strong moms. 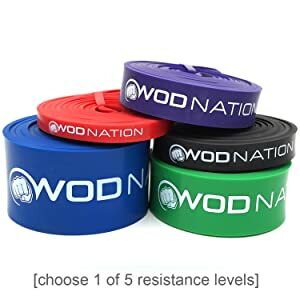 They also provide a narrower range of bands with no options for band sets – running into all the same problems that we saw with the WOD Nation bands above. 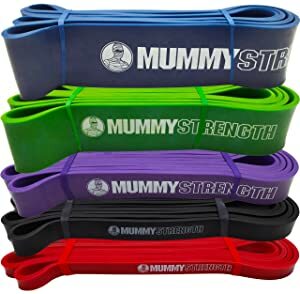 These products come with relatively good durability, but there are some concerns that tension sets in too early for a band as short as the MummyStrength bands. This is a concern for ductility: the product doesn’t stretch as much as you’d want for a pull-up band to be maximally effective. These are often problems associated with being a taller human. It’s not clear whether this is because the bands are designed for weight training specifically or if they’re designed to loop the knee during a pull-up (which is wrong for most CrossFit users, for example), but they have some issues. They also have some mild quality assurance problems when it comes to the greasiness of the product, though this is always a possibility when shipping rubberized products. Either way, you don’t want this product arriving in that kind of state! Overall, MummyStrength manages to sit joint-bottom with the WODFitters for the exact same problems: poor range, dubious quality, poor quality assurance. On top of all that, they charge for returns on defective products! We quite like Power Guidance as a company. They’ve proven themselves to be effective in the past with a number of products that we’ve reviewed, and their customer service has been up to scratch. We’re pleased to see that they’ve continued this trend with their resistance bands. 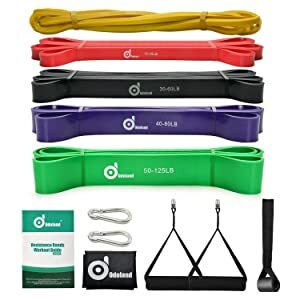 They only offer 5 resistance bands, which is less than we’d like, but also offer a great price and fantastically cost-effective set of 5 bands. The problem here is that the product itself is not particularly high-quality compared to others on this product. Customer service has been consistently reported to be great – but the fact it’s been needed so often isn’t reassuring. These bands are more likely to snap or tear than many others on this list. Power Guidance’s bands are better than WODFitters for buying options, but their overall quality is lacking and we’re disappointed to see these problems being so common. This is a set of 4 bands, which offers great value, but the actual range and effectiveness of the products is uncertain. With a range of only 90lbs – from 35 to 125lbs – there aren’t going to be as many ways to get the most from this product. Your actual training should be okay, but it isn’t optimal in the same way that the Serious Steel sets are. Overall, however, the quality of this product is consistently excellent. We’ve seen that customers are very happy with these products and their no-questions-asked guarantee for their bands is a great policy and a fantastic sign of the quality of these bands. We’d love to see a 5- or 6-band set with the same quality and value! Garage Fit is the clear winner for range and ease of purchase on this list. They include single bands for sale as well as a huge variety of band-sets to make sure you’re not paying for anything you don’t want. The overall price point isn’t perfect when we compare to other products on this list, but for saving money you can get the products you want without any extras. This is a great level of versatility and lets you tailor your purchase to your needs. These bands are spread across 8 tension levels – though they don’t tell us what the upper range of these bands is. The grey band has no clear tension-measurement on the sale page, so there’s some reason to be concerned by that if you need maximum resistance. Customer concerns do exist about the quality of these bands since they tend to stain other surfaces, develop strange residues, and their tension ratings have been consistently questioned. This leaves us very skeptical about the other benefits, leaving this product in the “maybe” pile! 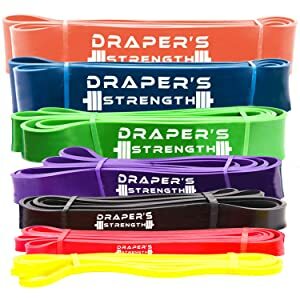 Draper’s Strength bands are very similar to others on this list – similar problems and benefits that all speak of white-label products. This is common for the fitness industry at large. 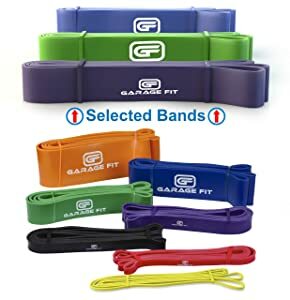 Bands range from 15lbs to 175lbs, with a variety of interesting sets that challenges Garage Fit’s range. With a 90-day money back guarantee, however, they provide a greater sense of security in your purchase and peace of mind that you’ll get a replacement if they’re not up to your standards. Common concerns are the same as normal: weird residue/smells, occasional breakages, and a consistently over-rated tension relation. This is a real concern for effective training and is likely to get worse as you use them more. 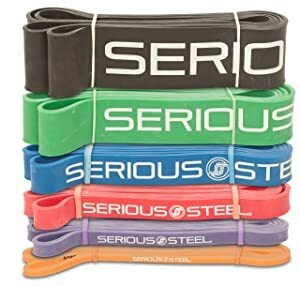 These resistance bands provide very little tension compared to others on the market with a 15-125lbs range. This is probably not ideal for most people who are starting pull up training – making this product a cheap but sub-optimal product overall. The 24 months assurance and return policy sounds great, as well as a price point that seems too good to be true. Customer problems seem to be almost entirely made up of snaps and totally-unusable products, so we’re concerned with the initial quality of the bands. While the 24 month assurance sounds great, it’d be even better to not need to return your bands at all and wait for replacements. We think this product is a cheaper (in both the positive and negative sense) version of the UPOWEX band set. The latter costs a little more but has a consistently superior product. This is another set of bands, similar to the previous product, that comes bundled with accessories but doesn’t manage to perform the basics as well as other products on this list. The range and color-coding of bands between 15 and 125lbs is exactly the same and provides familiar levels of tension. The problems are exactly the same, too! 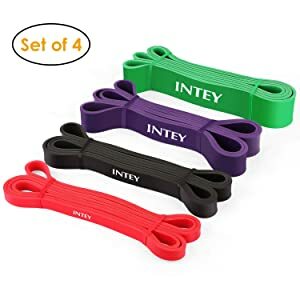 These bands are reasonably priced, but their quality is just as compromised as the INTEY sets with concerns for unravelling, smells, quality assurance, and the risk of serious bruising and injury during maximum tension exercise. Overall, a relatively good product, but easily out-classed by others on this list. Bands definitely make pull-ups easier! They’ve become a key part of how CrossFit athletes build their overhead pulling strength and develop upper back strength. They transition well to many of these movements due to their carryover to kipped movements. Combining band-assisted pull ups with other exercises. If you can get these right, you’re going to see significant progress towards your pull-up goals. Lucky for you, we’re going to take you through both of these and make sure you’re well-equipped for pull up progress. You need to progress your pull-ups through a slow and sustainable process. Banded pull ups offer a way of overloading the movement and giving your key muscles a chance to build strength. It takes out the common sticking point of the movement, the lower 1/3rd, and allows you to rep out pull-ups. This provides plenty of stimulus for improved muscle growth without being limited by the difficulty of pull ups. There’s a huge difference in difficulty with each pull-up – but once you can do one, you can start training them more effectively. The banded pull up takes stress off the shoulder joint when kept strict, too, so that can really help reduce overall damage put on the joints during the strength-building process. You want to focus on adding reps with the same band and then decreasing band assistance. The more reps you can handle and the less assistance you need, the closer you are to a full pull-up. Once you’ve achieved a few unassisted pull ups, you can begin training them normally and develop strength. But those first 1-5 pull ups are the real challenge and resistance bands can help. You need to consistently push yourself to progress in one way or another, just like with any other exercise. The band is no excuse to not-try: progression of your volume is still the key to your success here and provides a way to improve your pull ups without banging your head against the wall! The problem with banded pull-ups for athletes who aren’t in CrossFit is ignorance of other supplementary exercises that are central to gymnastic strength training. This can leave serious holes in your overall development and limit the progress of your pull ups. When we look at the development of gymnasts through the basic pulling movements, it includes a significant amount of volume in other movements. This includes exercises like the ring row, chin-up holds, and other crucial components of the full pull up movement. This is one of the crucial aspects of balancing your volume, but also providing effective preparation for future training. This is one of the most under-used aspects of gymnastic training: everyone wants to feel great about their pull-ups on the bands, but that only strengthens the top part of the movement. Developing strength and joint-stability in the bottom of the movement is even more important during this phase. If you hop straight from banded pull ups to kipping or strict variations, you’ll find yourself weak at best – and at serious risk of injury at worst. The patience to progress your accessory work alongside your banded pull-ups is what builds the foundation for effective strict pull ups and the gymnastic skills that build on it. A stronger base means a more sustainable and successful progression when you get rid of the bands! You’re building for the future. Building to last means putting the essentials first – this includes shoulder health, one of the most common health complaints in athletes and active people. This is a pretty simple one to get right, but it can be anywhere between embarrassing and painful if you get it wrong! To use a resistance band for pull ups, you need to loop the band over the pull-up bar and through itself. Pull the band down until it’s taut around the pull-up bar. You should now have a large majority of the band hanging down – the perfect position for a foot! Place your foot in the loop of the band and keep your legs straight with your feet squeezed together. Stay tight in the core but don’t allow the legs to bend – you need to stretch the band to make the pull-up easier. Lower yourself into the band tension and keep a controlled, smooth bounce out of the bottom of the movement. This will allow you to improve your pull-up and make the most of band momentum without introducing undue shoulder stress or losing position. This is hard to say. There are many brands of band that use different color codes for their products. What you really want to know is which size/resistance is right for you. Obviously, you’ll need to start with a strong band that can carry more of your weight and slowly decrease the resistance as your ability to rep it out improves. This should also be based on improvements in ring rows and other accessory work, too. The point is to work through additional reps – perhaps around 12 – before you change your band. Increasing the load at the weakest part of the movement can make a significant difference so you’re likely to lose somewhere in the region of 50% of your reps depending on what bands you’re using. You’d ideally get a set of resistance bands. 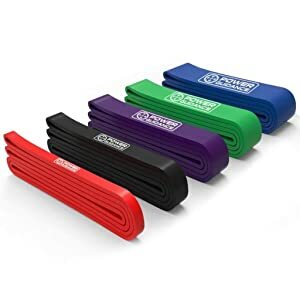 This provides a cheaper option on a whole variety of products and allows you to progress without having to repeatedly buy bands and wait for them to arrive before you get your training done. You need to know what to look for to get the best product. Here are the key points to look for. If you’re going to be putting your whole bodyweight through a rubber band and trusting it to hold you, then the quality of the product matters. The last thing you want is for the band to break – especially with the damage that can cause. The build quality of this kind of product is absolutely essential. A bad product risks injury at worst, but at the very least a waste of your money. The different resistance bands’ strength is going to be key for your training. If you can find a product with a great range – from heavy to light resistance – you can be more specific in your training. This is going to mean a more effective workout and the opportunity to progress more often by reducing the overall band-assistance. If you have bands that are spaced by 10lbs of resistance, they’re going to make your life easier than bands with 25lb jumps in resistance. Range and variety can make for a really helpful product – especially in resistance band sets. The quality of the company you’re buying from always determines what you’re getting and the experience you can expect. Going with a brand that has a history of good customer service, a reputation for quality, and good manufacturing practices all adds up to peace of mind. This includes anything from guarantees to a good return policy to being helpful if things go wrong. If you can afford a set of resistance bands, it’s a great investment. You’ll save money on the shipping and probably on the products themselves, as well as saving your time. Having a set of bands ready means, you don’t have to wait between buying new ones, and you can combine them in whatever order suits your training and progressions. It’s a bit fiddly, but you can double up your resistance bands for pull ups. This allows you to get more specific with the amount of resistance you want. If you’ve got a light band, this is really useful. You can introduce a new band with a second, very small one, allowing you to transition into the newer difficulty without the uncertainty or risk of a big change. Using two bands at once can also save you buying expensive, heavier bands. This is more important when you’re a beginner, since you’re going to need more resistance and you’re obviously paying for it! The band should be secured under your feet. Keeping the legs straight is an important part of developing the core strength and positioning necessary to do full pull-ups. Unless you’re very diligent, you’re likely to get lazy by putting the band under your knees. It’ll also not provide the same assistance, since you’re not stretching the band to the point of effective tension. Resistance bands are versatile pieces of equipment that should be part of any gym – whether it’s at your home or not. Mobility training often benefits from resistance bands – which can be used for exercises like shoulder dislocates, or even used to enhance a stretch by providing a distracting force. You can add resistance bands to other exercises – like squats or deadlifts – to change where they’re most challenging. This is a great way of improving things like throwing or jumping, which require huge force at the end of a range of motion. This depends on the quality of the product that you’re dealing with and how often you’re using it. A good resistance band should last for years, not months – though your individual product and use may vary. In the first place, you probably won’t need to wash or clean bands often. They’re only ever really covered in sweat or chalk – which are both inevitable. However, upkeep can improve the shelf-life of your bands and reduce wear and tear. The easiest way to do it is just to run a wet washcloth over them. This is key for removing chalk – which probably isn’t good for the rubber in the long-term. You could wash them throughout with a hose or other faucet, but this may not be ideal for your product depending on the type of rubber being used. The best bands on the market are those that are most durable and reliably effective as you apply tension. For these two key pointers, we come up with a favorite choice of UPOWEX for general use at a great price point, while Rogue’s bands and band sets provide better quality at a higher cost. 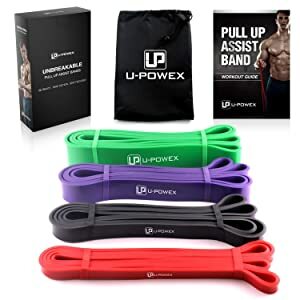 UPOWEX bands are going to be incredibly useful to anyone looking to get started with their pull-up training and need around 125-150lbs of assistance MAXIMUM. This is almost everyone – it’s rare that you’d need more. Rogue’s bands exist for these situations since their silver monster band is incredibly strong and durable at 200lbs of tension. They provide a better quality and smoother length-tension curve, which can be useful for serious, aspiring-elite athletes! The balance of quality and cost is a concern in every product. Fortunately, this list has shown us that you can get great quality at a great price, and elite quality at a good one. 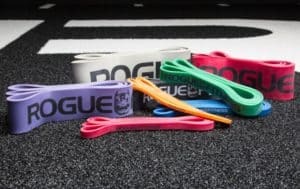 These two choices from UPOWEX and Rogue provide these options, giving you the best pull up assist bands for your needs!